Multiplexing is the transmission of different signals on the same transmission medium by avoiding that these signals interfer with each other. This is possible by sharing some of the resources of the transmission medium, and dividing at least one of them. This gives rise to the following multiplexing schemes. Send different signals with the same frequency in the same space, but at different times. 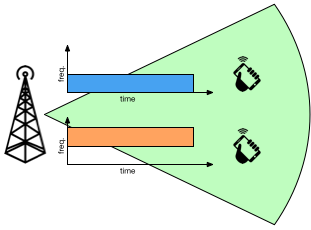 The time intervals during which each signal is sent must not overlap. The frequency and space resources are shared, and the time resource is divided. Send different signals at the same time in the same space, but to different frequencies. The frequency ranges on which each signal is sent must not overlap. The time and space resources are shared, and the frequency resource is divided. Send different signals at the same time with the same frequency, but in different spatial areas. 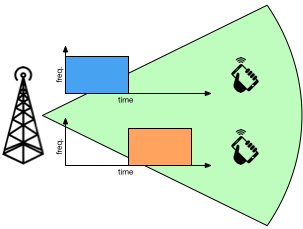 The spatial areas at which each signal can be received must not overlap. The time and frequency resources are shared, and the space resource is divided.